Abel Janszoon Tasman (c 1603–c 1659), maritime explorer and servant of the Dutch East India Company, was well qualified to command the Heemskerck and Zeehaen which sailed from Batavia in August 1642 to look for undiscovered land in the south Pacific. On 24 November he sighted the west coast of what he called Van Diemen's Land and later landed on the Forestier Peninsula, before sailing on to complete, via New Zealand and Tonga, the first circumnavigation of Australia. 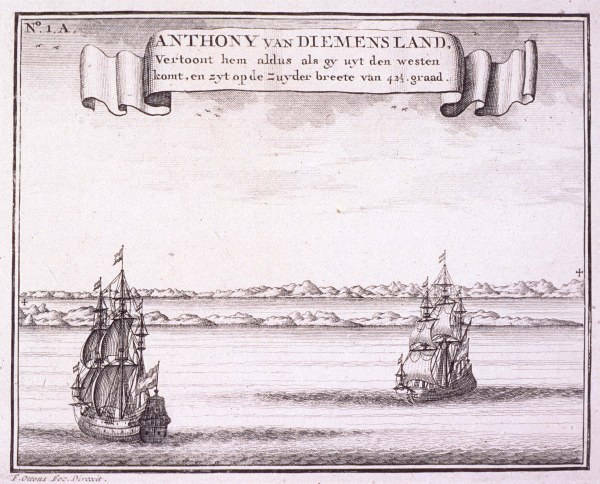 In 1644 another expedition under Tasman linked earlier Dutch discoveries from the Gulf of Carpentaria to the Pilbara. Tasman's willingness to undertake perilous voyages was balanced by exceptional skill and caution. He laid down, at least in outline, more of the Australian coastline than any other navigator and defined the broad limits of the island continent. Further reading: A Sharp, The voyages of Abel Janszoon Tasman, London, 1968.